Vigilance: Is Global Warming Slowing Down? Just in case you've been hearing different. Global warming has neither stopped nor slowed in the past decade, according to a draft analysis of temperature data by NASA's Goddard Institute for Space Studies. The analysis, led by Goddard director Jim Hansen, attempts to debunk popular belief that the planet is cooling. It finds that global temperatures over the past decade have "continued to rise rapidly," despite large year-to-year fluctuations associated with the tropical El Niño–La Niña cycles. The analysis also predicts, assuming current El Niño conditions hold, that 2010 will go down in history as the hottest year on record despite an unusually snowy winter in the Northern Hemisphere. Has Global Warming Slowed? Course this bozo doesn't know half of what Glenn Beck knows about it. "(March 31) -- In a reversal of a long-standing ban on most offshore drilling, President Barack Obama is allowing oil drilling off Virginia's shorelines. Obama's plan offers no concessions to environmentalists, who have been strident in their opposition to more oil platforms off the nation's shores. Hinted at for months, the plan modifies a ban that for more than 20 years has forbidden drilling along coastal areas other than the Gulf of Mexico. White House officials pitched the changes as ways to reduce U.S. reliance on foreign oil and create jobs - both politically popular ideas - hoping to divert attention from the deeply unpopular health care reform bill. The president, joined by Interior Secretary Ken Salazar, also announced that he is allowing an expansion in Alaska's Cook Inlet to go forward. In addition, the Interior Department has prepared a plan to add drilling platforms in the eastern Gulf of Mexico. Under Obama's plan, drilling could take place off Florida's Gulf coastline. Drilling already takes place in western and central areas in the Gulf of Mexico. The president's team has been busy on energy policy and Obama talked about it in his State of the Union address. "It means making tough decisions about opening new offshore areas for oil and gas development," he warned. Obama also urged Congress to complete work on an energy bill, which has remained elusive. The president met with lawmakers earlier this month at the White House about a bill expanding domestic oil and gas drilling offshore and providing federal assistance for constructing nuclear power plants and projects at coal-fired utilities. White House officials hope Wednesday's announcement will attract support from Republicans. The president's Wednesday remarks would be paired with other energy proposals designed to appease environmental groups. The White House planned to announce it had ordered 5,000 hybrid vehicles for the government fleet. And on Thursday, the Environmental Protection Agency and the Transportation Department are to sign a final rule that requires increased fuel efficiency standards for new cars eventually." ""In the United States only one of the past 10 winters and two of the past 10 summers were cooler than the 1951-1980 climatology, a frequency consistent with the expected 'loading of the climate dice,' " the scientists wrote. Hansen and other co-authors could not be reached for comment. The analysis has not been subjected to a peer review, though Hansen, in an email sent discussing the paper, said he intended to revise it for submission to a journal "within a month or so." "Essentially he's just pointing out that we've come out of this short-term, relatively cool period," Mann said. "The globe clearly continues to warm." Joe Romm, editor of ClimateProgress.org and a senior fellow at the liberal Center for American Progress, added that the study is "important for those who care about the science." Whether it would quell the debate over global cooling - fueled in part by the East Coast's hard winter and the revelation of errors in the United Nation's Intergovernmental Panel on Climate Change synthesis report - is less certain. Mann said many claims of global cooling are spurious and "intellectually dishonest." "The question becomes can you confront those who are choosing to be intellectually dishonest with more facts and hope they become more honest? Unfortunately, that's not the case," he said. "But hopefully, as evidence continues to come in, those who have genuinely, honestly skeptical views about climate change will be swayed by the fact that evidence continues to ... to be stronger and stronger." Romm was hopeful the analysis might inspire media to become less prone to arguments the globe is cooling. "If journalists want to write their global cooling piece, they better get it out soon," he said. In an e-mail that accompanying the study, Hansen suggested defrocking the cooling theory was a chief aim of the subject. "Somehow we have to do a better job communicating," he wrote. "The paper has relevance to current public discussions, but the usual scientific journals are not too accommodating for explicit discussion of that relevance."" how low our scientific community has sunk! "A strain of the bacteria that causes the sexually transmitted disease gonorrhea is morphing into a “superbug” and may soon be resistant to all available treatment options, according to a scientist speaking at the Society for General Microbiology’s spring meeting in Edinburgh, Scotland. Gonorrhea is one of the most common STDS -- infecting about 700,000 Americans a year, according to the Centers for Disease Control and Prevention. Catherine Ison, a microbiologist with the Health Protection Agency in London, told attendees at this year’s Society for General Microbiology meeting that the multi-drug resistance of the bacteria Neisseria gonorrhea is threatening to make the STD, which can infect not only the male and female genital regions, but also the mouth, throat and eyes, hard to treat. Any sexually promiscuous person is at risk for gonorrhea, with the highest infection rates in the U.S. among teens, young adults and African Americans, according to the CDC." What happened to the victory lap Obama was supposed to be taking? What happened to the spike in the polls for both him and for health care, for his acclamation as being a man who could govern, and his party, as being able to lead? What happened to being allowed to "move on," once health care was done with? What happened to his coronation -- as some bloggers had it -- to being our cooler and new FDR? Well, there was a small spike in the ratings, but it came from his base, which now "strongly approves" as opposed to being indifferent, but the independents who turned against him last summer are angry and not turning back. He and health care are still underwater, and the ratings for health care itself are abysmal. He is bleeding among the middle class that elected him, and that the health care bill had been drawn to win over. Outside his base, he polls less like FDR than like FDR Jr. He is tied for re-election with an unnamed Republican, and 54 percent of poll respondents think he won't make it. Far from being cowed, his opponents are pumped, and the public supports them. A CBS poll says 62 percent of respondents want Republicans to go on fighting the measure. A Rasmussen poll says 55 percent want the act repealed altogether. It wasn't supposed to work out in this manner. But work out in this manner it has. To see why, let's amble down memory lane, to the autumn of 1973. Under siege and suspicion for illegal activities, Richard M. Nixon was asked to turn over his infamous tapes to the Ervin Committee and Archibald Cox. Nixon offered a written synopsis, which he would, of course, edit. Cox refused. Nixon decided the only way out of his quandary was firing Cox. He did (after two attorneys general resigned in defiance) and quite justly cooked his career. It wasn't illegal, but it was illegitimate, in that it violated the sense of the law, the spirit of justice and the sense of propriety that holds cultures together. Nixon was toast. People could not overcome their aversion to that. The passage of health care has a connection, in nature and kind. Before Scott Brown appeared, the bill, while unpopular, was headed on a legitimate path to enactment, by passing the House and the Senate, and going into a conference committee, after which the revised version would be sent for final affirmation to the Senate and House. After Brown, this couldn't occur as the Senate would kill it, so it had to sneak by -- against the popular will and by bribes, threats and buy-offs -- through a loophole for which bills of this import were not intended. Big bills aren't supposed to squeak by on a simple majority, and under proper procedure, it would not have happened. It followed the law, while it shattered its intent. The whole country knows it's a fraud. As a result, it's a "law" that the country feels little respect for and feels morally free to resist. It is a law with an asterisk, a law with a stench, a law few regard as conclusive or binding. Spit on the law and the public, and the public will seek ways to use law to deny you. This fire will burn a long time. That's not true. 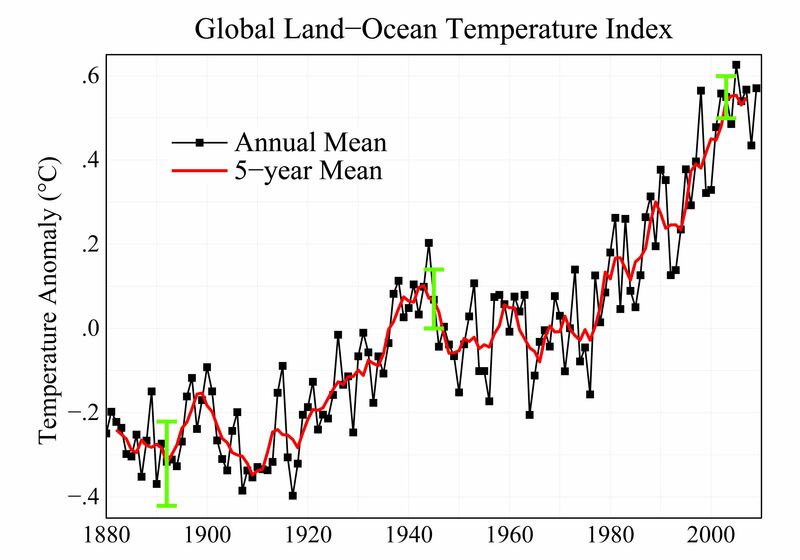 Look at the data recorded on NASA's Global Land-Ocean Temperature Index graph. Everyone can see no temperatures in the past decade were anywhere near as low as "the average [temperature] of the period thirty-sixty years ago". Reconciliation is a legislative process of the United States Senate intended to allow consideration of a contentious budget bill without the threat of filibuster. Omnibus Budget Reconciliation Act of 1990, Pub.L. 101-508 (1990). Omnibus Budget Reconciliation Act of 1993, Pub.L. 103-66 (1993). Spitting on *minority* lawmakers and using the n-word in public isn't good for the tea baggers' cause. It makes them appear to be intolerant racists. There is not one shred of proof that the "n" word was used at the tea party rally. There is not ONE tape, not one recording -- NOTHING. CNN took a week to go through all of their tapes and they could find nothing. The place was crawling with cameras -- nothing. "SHARPTON: People standing outside of Congress using the n-word. O'REILLY: How do you know they did that? SHARPTON: I have seen the tape. O'REILLY: There is no tape. There is no tape with the n-word on it. There's no way. Let's be clear. There is no tape. SHARPTON: So everyone hallucinated the n-word use? O'REILLY: I don't know what happened and you haven't seen the tape. SHARPTON: And the f-word against Barney Frank? O'REILLY: You haven't seen the tape. SHARPTON: There were all kinds of reporters that were there, Bill. O'REILLY: No. No reporter said this one said the n-word. The police who were there didn't hear any n-word. I'm not saying it didn't happen. I know John Lewis, and I think Lewis is an honorable man. If he says it happened to him, if Lewis says it happened to him, I will believe Lewis. He is an honorable man, but Lewis won't come on this program or any other program and make that accusation. You have got to be careful, Reverend. You just said you heard the n-word on a tape. There is no tape." Right, so all those Congressmen and reporters who heard the n-word being used must be in cahoots. I mean a conspiracy theory is the **only** possible explanation, huh Fearful Anone?